Players pass in sequence i.e. X1 to X2 to X3 etc. Pass to back foot X2 & X5. Prog 1 Pass and follow, Change direction. Prog 2 X2 & X5 run away and check to recive. R runs at an angle to receive ball from S on back foot he then dribbles, changes direction and passes to S without a ball. Prog add 2/3 defenders if player is marked he passes ball back to server. 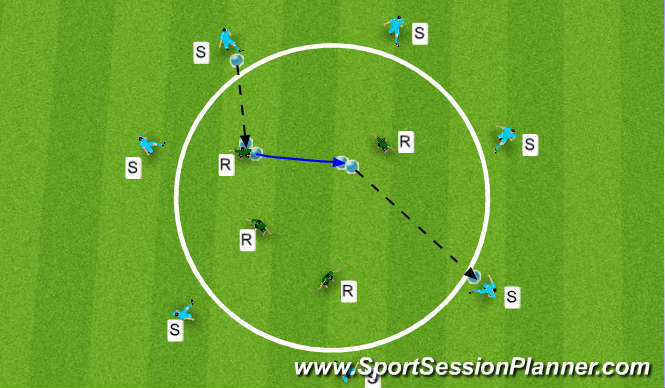 Ball starts with GK attacking team attempt to score by playing through each 1/3 of pitch. Player who passes ball into next 1/3 can go into that zone to create overload. if defender wins ball attacker must go back into their zone. Passingto back foot good tachnique no bobbles using both feet. 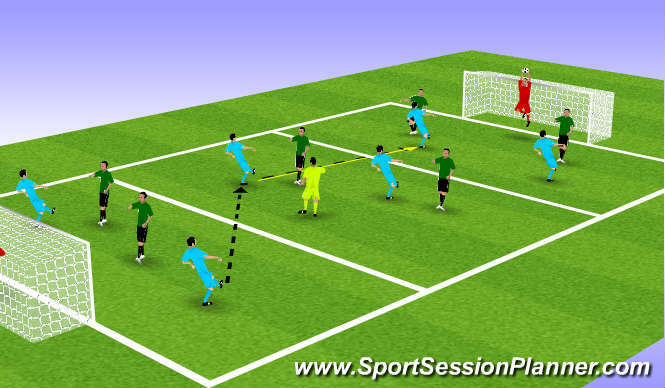 Good angles/distances of support - selection and execution of pass create space to receive. Communication - good information to man on the the ball. Players coped with the 1st part of the session well, big improvement with the passing & reveiving unopposed. Players struggled a little more when opposed during game. Angles of support and body positioning need to improve for certain individuals.